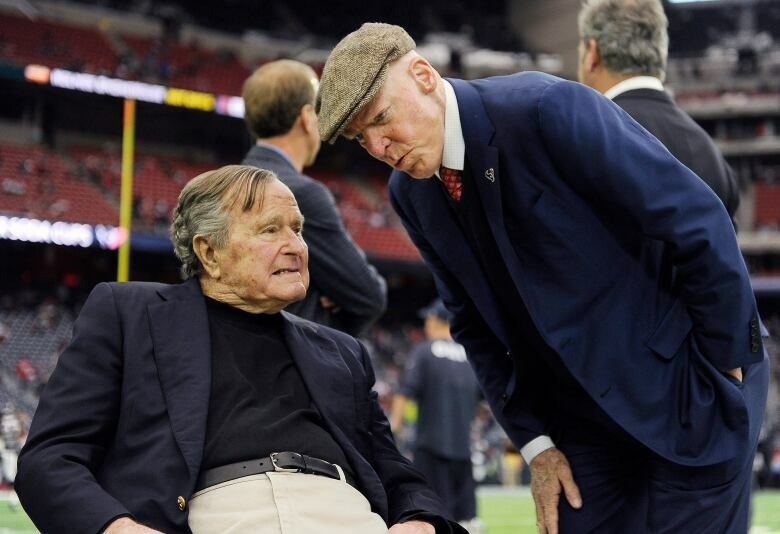 Former U.S. president George Herbert Walker Bush, the businessman-turned-politician who vowed to propel the country toward "a thousand points of light," has died at age 94. 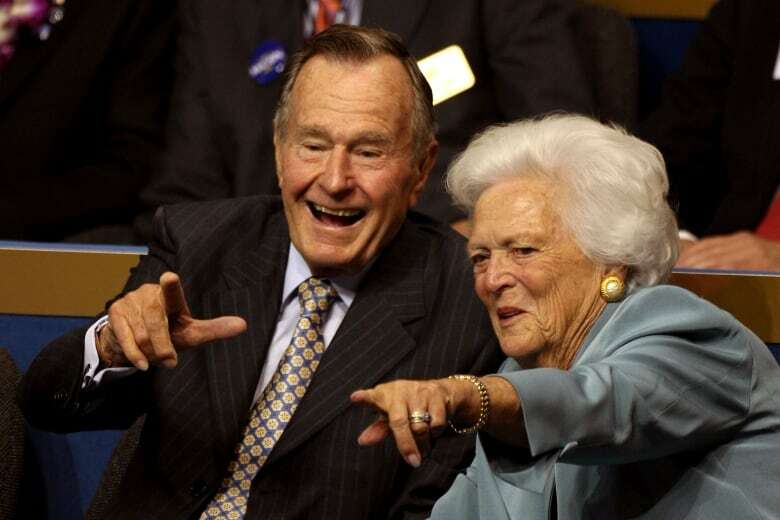 Bush died peacefully at his home in Houston shortly after 10 p.m. CT Friday, a source close to the family said, about eight months after the death of his wife, Barbara. His death was first announced in a brief statement issued by longtime spokesperson Jim McGrath, who said funeral arrangements had yet to be scheduled. No further details about the circumstances of his death were immediately available. 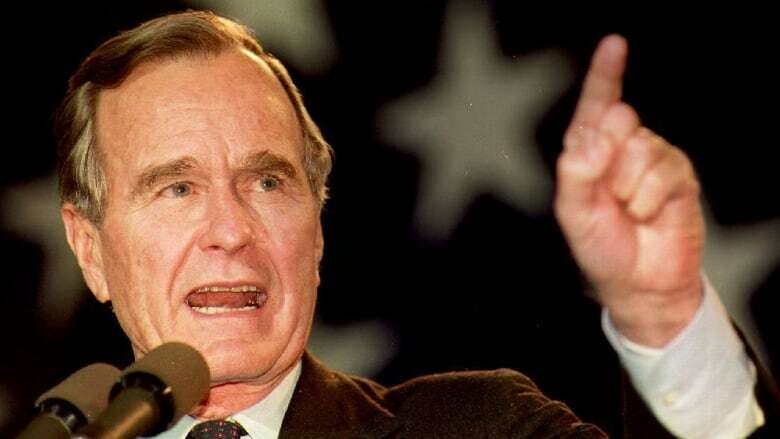 Congressional leaders announced the day after his death that Bush will lie in state in the Capitol Rotunda from Monday evening through Wednesday morning. Bush, president from 1989 to 1993 and father to former president George W. Bush, was elected the 41st president after promising to usher in a "kinder, gentler America." George H.W. Bush also made it a top priority to have good relations with Canada and his friend, then-prime minister Brian Mulroney. On his first trip to Ottawa as president, Bush assured Mulroney he would soon introduce environmental legislation to curb acid rain, paving the way for a bilateral accord with Canada. Speaking to reporters, the president even offered a little French, welcoming a prompt for a final question with a playful "C'est fine pour moi." But, shivering in sub-zero cold, Bush quickly added in English: "It's colder than hell." George Herbert Walker Bush was born June 12, 1924, in Milton, Mass., and raised in Greenwich, Conn.
His father, Prescott Bush, was a Wall Street lawyer and Republican senator. The future president's mother, Dorothy, was the daughter of a wealthy Missouri stockbroker. 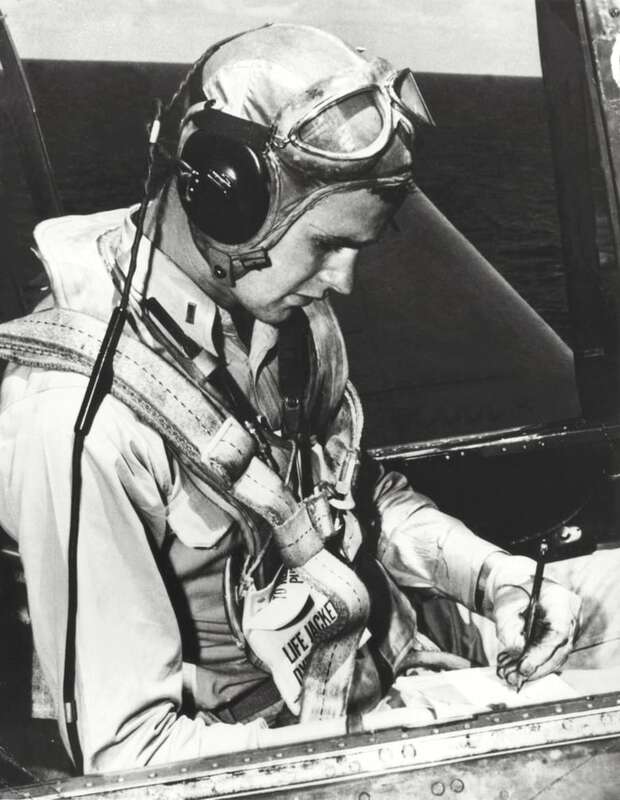 Bush joined the Second World War effort in 1942, becoming, at age 18, the navy's youngest pilot. He flew 58 missions over the Pacific Ocean, including one where his plane was shot down by Japanese anti-aircraft fire. Bush was rescued by a passing U.S. submarine and later awarded the Distinguished Flying Cross for bravery in action. Shortly before the war ended, Bush married Barbara Pierce in January 1945. Barbara Bush died on April 17, 2018, at age 92. The couple had six children: George, John (Jeb), Neil, Marvin, Dorothy and Robin, who died of leukemia at age three. Bush went to Yale University where he studied history, captained the baseball team and joined the secretive Skull and Bones society. In 1953, he moved his family to west Texas where he co-founded Zapata Petroleum and became president of the Zapata Offshore Company. Bush's first foray into politics came in 1964, when he lost a bid for the Senate, but the young Republican won a seat in the House of Representatives in 1966. Bush lost a second run for the Senate in 1970. 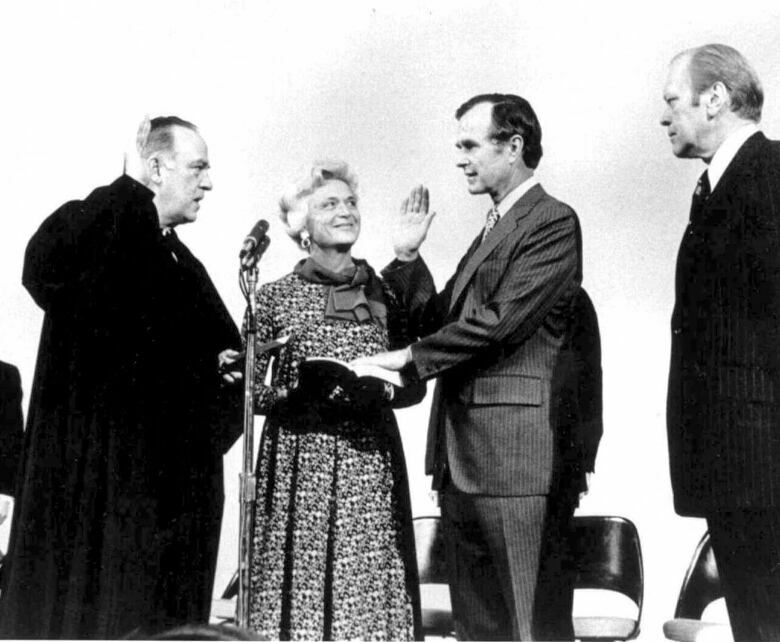 The Richard Nixon and Gerald Ford administrations appointed Bush to posts including UN ambassador, envoy to China and director of the Central Intelligence Agency. After a return to business, Bush lost a bid for the 1980 Republican presidential nomination but was chosen as Ronald Reagan's vice-presidential running mate. They won, and repeated the victory in 1984. As vice-president, Bush faced controversy when critics scrutinized his role in the Iran-Contra Affair, in which the Reagan government funded anti-communist Contra rebels in Nicaragua using money from the sale of arms to Iran. In 1988, Bush took up the presidential challenge, making a statement in his Republican nomination speech that would become a rhetorical touchstone for him. "I will keep America moving forward, always forward, for a better America, for an endless enduring dream and a thousand points of light," he told the crowd in New Orleans. At the same time, he was battling a media image he didn't relish — that of a wimp. But a feisty showdown with CBS News anchor Dan Rather helped to dispel suggestions the presidential hopeful was weak, a view that had haunted him from Doonesbury cartoons in the mid-1980s to the front cover of Newsweek magazine. Bush was elected president with 53 per cent of the popular vote on Nov. 8, 1988, winning with running mate Dan Quayle over Democrat Michael Dukakis and promising a "kinder, gentler America" with more wealth for the middle and working classes. Bush made Canada his first foreign destination as leader, three weeks after his 1989 presidential inauguration. Bush followed through on his commitment to get a Clean Air Act passed through the U.S. Congress. He then met Mulroney in Ottawa in March 1991 to sign an agreement to reduce emissions on both sides of the border that cause acid rain. During another visit, in 1990, Bush threw the opening pitch at the Toronto Blue Jays' home opening game. Bush and Mulroney were booed as they took the field. Bush's time in the Oval Office was one of significant international change and conflict. The Berlin Wall fell and the Soviet Union collapsed. The first Gulf War of 1990-91 saw the U.S. lead a coalition force under the name Operation Desert Storm aiming to force Iraq from Kuwait. At home, the worries were of a more economic kind. Despite his 1988 campaign declaration, "Read my lips: No new taxes," Bush hiked taxes to fight a rising budget deficit. He proposed the North American Free Trade Agreement, bringing Mexico into the free-trade fold and aggressively continued America's so-called War on Drugs. There were international conflicts closer to home, too. 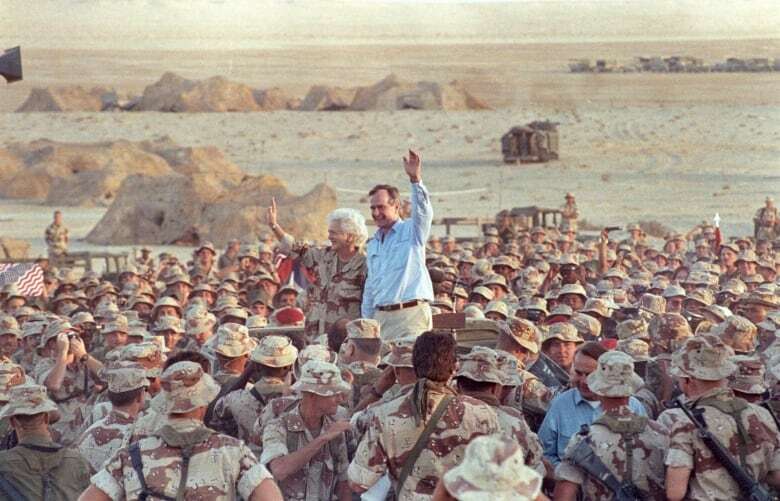 In 1989, Bush sent 24,000 U.S. troops to Panama to help topple President Manuel Noriega, an operation that was denounced by the UN General Assembly. His presidential popularity went on a roller-coaster, soaring after Iraq's retreat but plunging to dismal lows when Americans began to feel he wasn't doing enough to boost an ailing economy. After one term, Bush was devastated by a loss to Democrat Bill Clinton in the 1992 presidential election. Eight years later, though, he helped another Bush on his way to the White House. George H.W. 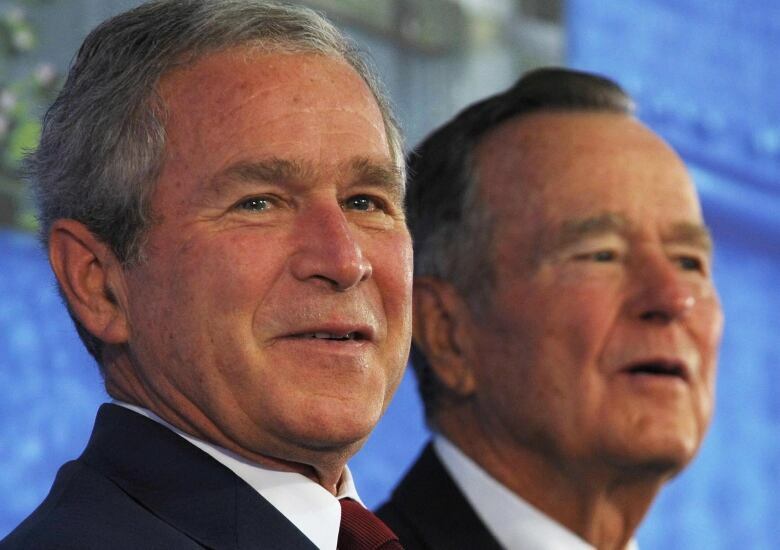 cheered his oldest son George W.'s controversial win over Democrat Al Gore. Younger son Jeb served as Florida governor from 1999 until 2007, and sought the Republican presidential nomination for 2016 until poor results in early primaries forced him to bow out of the race. While avoiding the political spotlight after his White House years, the senior Bush stayed active. He celebrated his 75th, 80th, 85th and 90th birthdays by skydiving. At the invitation of his son George W., the senior Bush teamed with his old nemesis Clinton to raise funds for disaster victims. Their efforts aided those devastated by the 2004 South Asia tsunami and hurricanes Katrina and Rita in 2005. Bush had a form of Parkinson's disease, and in his later years used a wheelchair or motorized scooter. He was in and out of hospital from 2012 until his death.